Have you seen some dishes that resemble a folk art design and have cute little sayings on them? What you are looking at, was a very unique pottery design from England that was mainly produced from the 1920s and 1950s. With all kinds of sayings incised into the clay, the pottery became known as Motto Ware. There were several different companies making the pottery. Some of the special little sayings were based on dialect from the South Devon area. This simplistic motto ware has continued to attract attention. It is always fun to read what the saying is on the item. What led to the development of this pottery? In 1865, the discovery of a rich deposit of the red terra cotta clay in the Watcombe area gave the local potters a new medium to work with. Superb art pottery was created for many years. Many new pottery companies were formed to take advantage of the beautiful red clay. Watcombe Terracotta Clay Company, the first to open, was founded in 1869. Their major wares consisted of basic urns and vases. Statues were also created with a classical style. Torquay Terracotta Company, the next company to open 1875, mainly produced what was selling well at Watcombe. The third major pottery to open in the area was Aller Vale Pottery who also produced similar items. The 1890s, brought the Arts and Crafts Movement for design. Aller Vale was the first to shift to this new style and was soon followed by the other two companies. Within several years, the area was soon populated by about 20 companies each trying to create a product that symbolized the life style of the people living in the area. 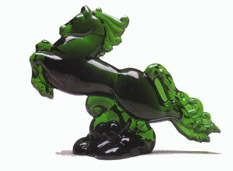 It was the creation of tourist trade souvenirs in the 1920s that generated so much attention on this small English area. Tourists visiting the area loved the local pottery but couldn’t afford their art ware. Most were looking for more inexpensive souvenir items to purchase and made some requests to the local potters. The various potters soon developed simplified designs and mottos were added to the pieces. The designs found on the front sides were typically cottages and chickens but there are pieces that can be found with ships and flowers. These were all hand painted on the clay and then given a clear glaze over the top. On the back side were the different mottos that were based on cute little sayings along with some from the Devon dialect. The sayings were scored through the glaze to reveal the red clay after the piece was painted and then it was fired to make the design permanent. The tourists loved the pottery and sales soared. The potters continued to satisfy their requests by making huge amounts of this style of pottery. Motto ware was the mainstay of the various companies for about 50 years even though they also continued to produce other types of items. The height of the motto ware popularity was mainly the time period between the two world wars. In today’s collecting world, what better type of pieces could one ask for: small in size, not very expensive, and different shapes. The sayings range from cute, to just down right profound. Most antique malls and shows will have a piece or so for the collector to decide from. To further promote the Devon potteries, the Torquay Collectors Society was founded in 1976 by Ian Green. The idea was to offer further research material to collectors. The Society publishes a quarterly newsletter and has four national meetings a year. One of the most interesting things the society has done is develop a listing of all the known mottoes that were placed on the pottery items. In looking at their list there must be several thousand of these special sayings. 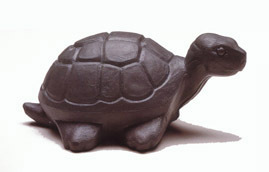 Go to their web site at: http://www.torquaypottery.com/mottoes.htm to see the list they have developed. All the sayings are listed alphabetically. It is amazing to see how many mottoes there are. Their web site also has the information on how to subscribe to their society. Enjoy your search for these unusual pieces of pottery.